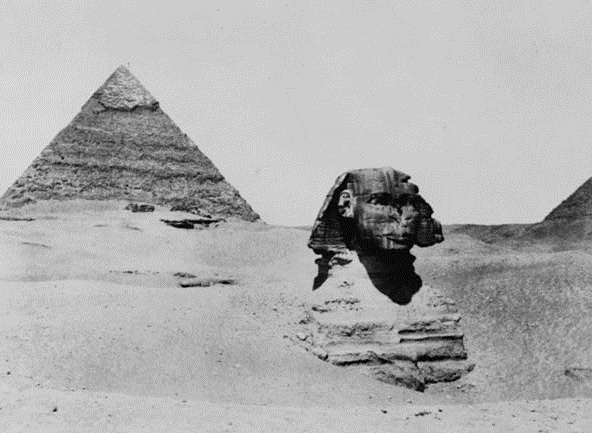 boldest claims: that the Sphinx had nothing to do with Khafre. When Pharaoh Thutmosis IV fell asleep before the head of the Great Sphinx at Giza, he recorded that the statue had spoken to him in a dream. He said the Sphinx had told him to clear away the centuries of sand that choked its body and hid all but its head from view. The Sphinx then promised the young Thutmosis (also spelled Tutmosis) the throne of Egypt for doing this work. And so he cleared the Sphinx of its sand and set up between the massive lion's paws a stela on which he recorded his dream and promised to restore the statue of the Pharaoh Khafre. Or did he? New evidence shows this is not the case. The original attribution of the Sphinx to Khafre came about when Egyptologist Henry Salt made a facsimile of the damaged stela set up before the statue by the later Pharoah Tutmosis IV. The last line still legible bore the syllable "Khaf," assumed to be Khafre. Other people copied this copy because the stela's inscriptions had worn off with time. Thomas Young made the most famous secondary copy and based his translation on it. The accepted version of thirteenth line of the stela, the one bearing the syllable "Khaf," reads in the Young translation: "...which we bring for him: oxen... and all the young vegetables; and we shall give praise to Wenofer ...Khaf.... the statue made for Atum-Hor-em-Akhet." The last name refers to the Egyptian gods Horus and Atum in their joint form as the Sphinx. Young then added the syllable "re" to "Khaf" on the assumption that it referred to the Pharoah of that name. In 1905 James Henry Breasted concluded that Young's translation was wrong because his copy of the stela showed no cartouche around the "Khaf" syllable: "The mention of King Khafre has been understood to indicate that the Sphinx was the work of this king--a conclusion which does not follow; Young has no trace of a cartouche." However, Young had derived his copy from Salt, and no one thought to check on the condition of the original. Mystery of the Sphinx co-author Robert Bauval said on June 5, 2001: "No we didn't see Salt's manuscript... We accepted Breasted on this issue, and still do." The next day everything changed. Through a complicated maze of textual references, posters on Hancock's message board found that the later copies (from which Hancock and Bauval derived their knowledge of the stela) missed an important detail of the original facsimile: the 1820 copy showed a cartouche, implying the "Khaf" syllable belonged to King Khafre. Bauval promised to consult the British Museum's copy of Salt's orginial facsimile. On June 6, he broke the news: "I can report that there is little doubt now that Henry Salt had recorded a half-cartouche in 1820 around the two syllab[les] 'Kh' (rising sun) and 'f' (slug) supposedly forming Khafre's royal name." Bauval says this new finding contradicts his earlier claims but does not alter his view that someone earlier than Khafre built the Sphinx: "It still does not prove or disprove that Khafre actually 'built' the Sphinx, but it does show that Tutmosis IV associated his 'dream' and/or the Sphinx with Khafre." 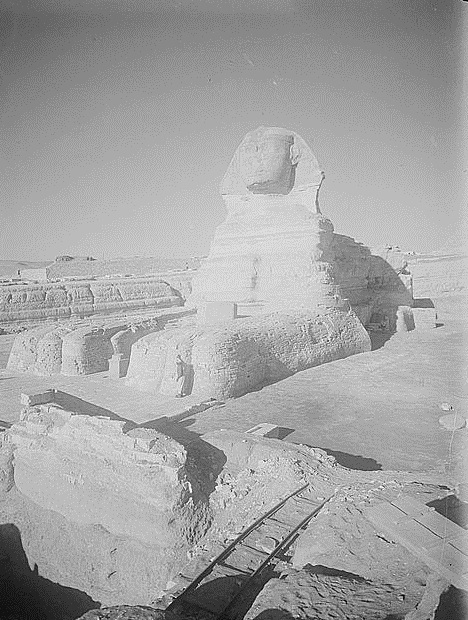 In 1900, the French Egyptologist Gaston Maspero took the Khafre reference to imply that there was a clearing of the monument "under this prince, and consequently the more or less certain proof that the Sphinx was already covered with sand during the time of [Khafre's brother] Khufu and his predecessors..."
In Fingerprints of the Gods (1995), Graham Hancock presented opinions from 19th and early 20th century Egyptologists saying the Sphinx was older than Khafre. 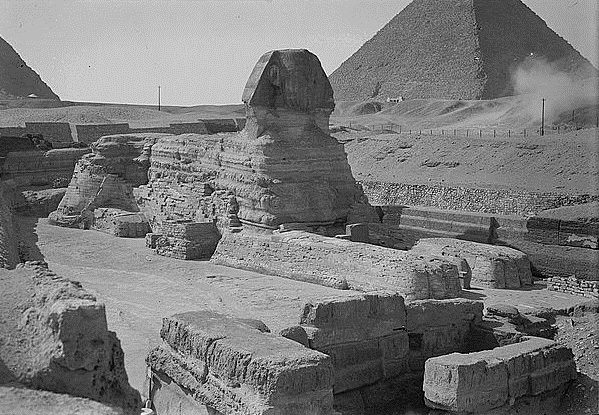 He quotes the British Museum's E. A. Wallis Budge's 1904 opinion that the Sphinx "was in existence in the days of Khafre, the builder of the Second Pyramid, and was, most probably, very old even at that period." These opinions accorded well with the other important theory circulating about the origin of the Sphinx: that it was, in fact, a relic from a lost civilization. In the early 1990s a small group of maverick researchers began to look at the distinctive pattern of rippling waves visible on the body of the Sphinx and the walls surrounding it. When they examined the erosion on the limestone body of the statue, they came to a stunning conclusion: the Sphinx had been weathered by water, not by wind. Up until that point, most Egyptologists had believed that wind had carved out channels on the Sphinx, abated only by long periods when the statue was hidden beneath encroaching desert sands. The team consisted of geologist Robert Schoch and maverick archaeologist and tour guide John Anthony West. West did extensive work on the statue, measuring and photographing all of the weathering on the body of the lion and the walls of the "Sphinx enclosure" surrounding it. His conclusions were mind-blowing. West concluded that the weathering occurred by falling water, not blowing wind. This meant that extensive rainfall must have weathered the statue before the desert sands had buried it. Since the last Egyptian rainfall of that magnitude was over 7,000 years ago, this meant that history as we know it needed an overhaul. A team of geologists led by Dr. Robert Schoch of Boston University reached the same conclusions, and it seemed a number of prominent geologists agreed, though today that is in dispute. Archaeologist Michael Brass says "West said to me he couldn't supply any names because they hadn't paid attention and gotten names. Yet he still continues to claim this anonymous support, which cannot be tested, and to say these names can be provided." West says he can provide names "but before going to the time and trouble it takes to dig this out of our files, I think it only fair that we are first provided with [the] qualifications and credentials [of those who ask]." As of June 2001, West had not supplied any of the 250 names he claimed supported the water-weathering hypothesis, but a few scientific journal articles have appeared both for and against the West-Schoch theory. "Schoch's ideas ignore several things. 'Precipitation-induced weathering' versus 'wind-induced weathering' producing different weathering morphologies is not an accepted idea, rather variations in the rock usually account for the different weathering morphologies." Matthusen claims that different densities of the layers of Giza limestone account for the weathering pattern. However, neither side has absolute proof, and the water-weathering is a seductive hypothesis, much simpler to understand and agree with than an obscure "hydrostatic exfoliation." West went on to say that Schoch's proposed building date of 5,000-7,000 B.C. did not go far enough. Without any formal geological training, West revised the figure to 10,500 B.C. based on French mathematician R. A. Schwaller de Lubicz's 1961 book Sacred Science. In it, Lubicz postulated, "A great civilization must have preceded the vast movements of water that passed over Egypt [in 10,000 B.C. 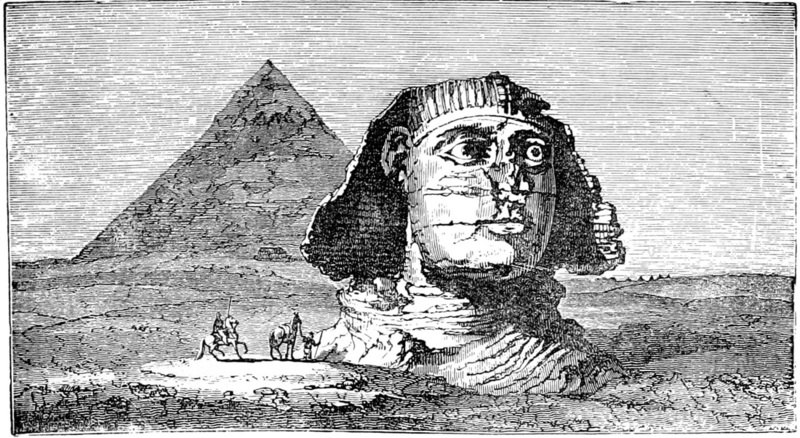 ], which leads us to assume that the Sphinx already existed... whose leonine body, except for the head, shows indisputable signs of aquatic erosion." West, Hancock and Bauval then go on to use the assumption that the Sphinx predated dynastic Egypt to prove that the a lost civilization existed. Their proof? The Sphinx already existed. In other words, based on Lubicz's assumption of an old Sphinx, they conclude that an ancient civilization existed because the "evidence" shows they built the Sphinx. Thus the assumption is also the conclusion.